Cancer is dangerous. Don’t flirt with disaster. Don’t eat it and don’t go near it. Don’t drink it. Don’t put it on your skin. Yes, this is a warning not to put cancer on or inside your body. Cancer is in GMO pesticide DNA seed designs and the treatments used on vegetables and fruit. Cancer is in sun block lotions full of toxins that hold in your sweat and block out the vitamin D you would normally get from the sun. Cancer is in cosmetics, makeup, soaps, toothpaste and shampoos. Cancer may be lurking in your refrigerator, your pantry and in your medicine cabinet, but it has an archenemy. Cancer has a rival that destroys it like an M-60 leveling a field of enemy soldiers. It’s called “hydrogen peroxide,” and the “lame-stream,” mainstream media will tell you how “dangerous” it is at 35%, but they won’t tell you that you can drip a couple drops in a glass of water each day and end cancer. Yes, it’s true. 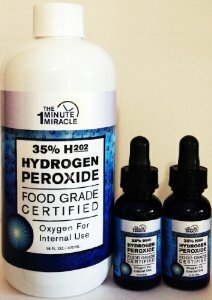 But before getting into the use of hydrogen peroxide to treat cancer, it should be emphasized that while hydrogen peroxide is an excellent treatment for cancer, using hydrogen peroxide to cure cancer does not deal with many key issues faced by advanced cancer patients whose bodies have been severely damaged by their cancer and by their orthodox cancer treatments. In many cases, it is not the cancer cells which kill cancer patients, but rather other issues, such as damage to key organs, damage to non-cancerous cells, etc. 5) Protecting the organs from damage caused by the cancer and orthodox treatments, etc. Great article. Very informative! Where is the best place to buy this type of peroxide?